The Environmental Law Centre (ELC) encourages all Albertans to consider how governments, industry, communities and individuals can assist with adapting to climate change. The ELC’s second volume in our Climate Change and the Law report, Part Two – An Introduction to Adaptation in Alberta provides a broad overview of the issues Alberta is likely to face due to climate change, now and in the future, and the legal tools and measures that could be used for adapting to these issues. You can read Climate Change and the Law: An Introduction to Mitigation in Alberta here and stay tuned for a future blog series. What is adaptation and why does it matter? Adaptation is the process of preparing for actual or projected changes in climate averages and extremes. As we now know, anthropogenic climate change is here and its impacts are already unavoidable and irreversible. Going forward, as greenhouse gas (GHG) emissions continue to rise, these impacts are expected to continue and worsen. In fact, even if GHG concentrations were stabilized today (spoiler alert: they are not) ocean warming and sea-level rise would still continue for centuries. Previously, human and natural systems have had the capacity to cope with climatic change. But the pace of modern climate change is on track to exceed these coping thresholds (and then some). Accordingly, the purpose of adaptation is to build the capacity to cope with climate change such that risks are answered and opportunities are captured. How does adaptation differ from mitigation? In the first volume of ELC’s Climate Change and the Law report, Part One – An Introduction to Mitigation in Alberta , the ELC discussed the concept of mitigation and the regulatory framework required to support the mitigation of GHGs in Alberta. Going forward, adaptation is a necessary complement to mitigation. Whereas the goal of mitigation is to reduce or prevent changes in the climate system, adaptation is concerned with addressing the consequences of these changes. The impacts of mitigation and adaptation measures are recognized at different levels and realized at different times. Mitigation tends to have global benefits whereas adaptation is typically felt at a local or regional level. Meanwhile, the benefits of mitigation carried out today will not be evidenced for decades (due to the long residence time of GHGs in the atmosphere), whereas adaptive measures can reduce vulnerability to climate variability immediately. As a result of these asymmetries, action on mitigation tends to come from international agreements, while action on adaptation historically stems from affected people, communities, and countries. Why does the law matter to adaptation? Climate adaptation can take many forms, including technological, financial, behavioural, and managerial activities. However, the focus of this volume is on the role of our laws in facilitating adaptation, that is, the ways in which legal institutions and tools can be used to implement adaptation measures. The law touches on nearly every area of modern society which makes it a particularly powerful tool for effecting adaptation. Relevant legal tools can include legislation, contracts, negligence (tort) law and other legal measures such as voluntary industry based codes, market of financial mechanisms, collaborative partnerships, and information based tools. Note that legal tools also face particular barriers. Governments may fear that action on adaptation could leave them open to lawsuits or give rise to compensatory duties. Privacy laws may also constrain the operation of early warning systems or the ability of institutions to target information to vulnerable residents based on personal data such as age, location or socio-economic status. Ultimately, adaptation law and policy must cope with multiple layers of uncertainty. Who is responsible for adaptation? Opportunities for adaptation exists at different levels (i.e. global, national and local), in different industries, and across time frames (i.e. short-term, long-term and very long-term). Given its heterogeneous nature, a variety of actors are required to address the challenges inherent in planning and implementing adaptation. This is because different actors have different capacities to adapt to climate variability and change. These actors include: government (national, provincial and municipal), industry, non-governmental organizations (NGOs), indigenous peoples, and the general public. What sort of impact is climate change expected to have in Alberta? In Part Two – An Introduction to Adaptation in Alberta the ELC summarizes Alberta’s current climate characteristics and some of the impacts that Alberta is currently experiencing or will likely experience into the future due to climate change. This information helps to contextualize and justify why adaptive measures are necessary in the province. In particular, Alberta will likely experience changes to its water resources (e.g. reduced snow accumulation, glacier retreat, decreased water quality and increase in extreme hydrological events), ecosystems (e.g. decreased biodiversity, phenological mismatches and reduced migratory waterfowl populations) and soil (increased landslides, wind erosion and desertification). A more fulsome review is included in the report. This brings us to the main focus of the report – what are the risks and/or opportunities associated with climate change in Alberta? What sort of legal adaptive measures are being (or should be) implemented to maintain resiliency in the face of these changes? Part Two considers a wide variety of sectors organized within the following five categories: (1) natural resources; (2) industry; (3) infrastructure; (4) biodiversity; and (5) human impacts. For example, with respect to the forestry industry (which falls under the category of “natural resources”), climate change is expected to bring risks that include changes to species distribution, increased “disturbance regimes” (e.g. fire, pests), increased disease outbreaks and drought, all of which will affect the quality and quantity of timber supply. Naturally, these anticipated changes will likely cause the forestry industry to suffer. However, there is also some potential for warmer climates and longer growing seasons to benefit northern tree populations. How to adapt to these changes? The forestry industry is governed by, among other pieces of legislation, the Forests Act. Going forward, one adaptive measure could be for Alberta to update the Forests Act and its associated regulations to reflect improved sustainable forest management practices. This could include adaptive measures such as assisted tree migration, development of drought tolerant and pest resistant genotypes, and ex situ preservation of rare populations. Note these adaptive measures can also have impacts on biodiversity and therefore must be exercised with caution and using the best scientific information available. In the face of increasing climate uncertainty, adaptation helps to provide a path forward. Currently, some progress is being made in Alberta, particularly with respect to engagement, awareness, and planning. But there is still a lack of action with respect to the actual implementation of adaptive measures. The aim of this report is to shed light on the risk and opportunities that climate change is expected to bring to Alberta and highlight how adaptive measures can be used to cope with these changes. 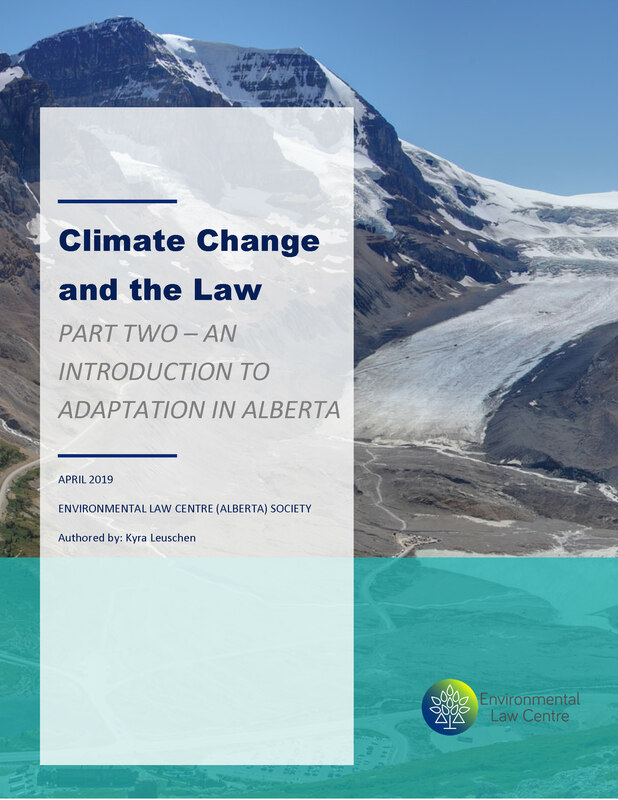 To learn more about this topic continue reading Part Two – An Introduction to Adaptation in Alberta and stay tuned for future blog posts as part of our Climate and the Law series. D. Bednar, J. Raikes & G. McBean, The governance of climate change adaptation in Canada, Institute for Catastrophic Loss Reduction Research Paper Series, February 2018 at 7 online: https://www.iclr.org/wp-content/uploads/2018/04/cca-climate-change-report-2018.pdf. IPCC, 2013: Summary for Policymakers in Climate Change 2013: The Physical Science Basis, Contribution of Working Group I to the Fifth Assessment Report of the Intergovernmental Panel on Climate Change, edited by: Stocker, T.F. et al., Cambridge University Press, p. 28, accessed online: http://www.ipcc.ch/pdf/assessment-report/ar5/wg1/WG1AR5_SPM_FINAL.pdf [IPCC, 2013: Summary for Policymakers]; F.J. Warren and P.A. Egginton (2008): Background Information: Concepts, Overviews and Approaches in: From Impacts to Adaptation: Canada in a Changing Climate 2007, edited by D.S. Lemmen et al., Government of Canada, Ottawa, ON, 27-56 at 29 accessed online: https://www.nrcan.gc.ca/sites/www.nrcan.gc.ca/files/earthsciences/pdf/assess/2007/pdf/full-complet_e.pdf [Warren, 2008: Background Information]. IPCC, 2013: Summary for Policymakers at p. 27-29. Alberta Environment and Parks (AEP), Climate Change Adaptation Framework Manual (Alberta, AEP, 2010) at 3. IPCC, 2007: Inter-relationships between Adaptation and Mitigation in: Climate Change 2007: Impacts, Adaptation and Vulnerability. Contribution of Working Group II to the Fourth Assessment Report of the Intergovernmental panel on Climate Change, edited by M.L. Parry et al., Cambridge University Press, Cambridge, UK, at 750 accessed online: http://www.ipcc.ch/pdf/assessment-report/ar4/wg2/ar4-wg2-chapter18.pdf [IPCC, 2007: Inter-relationships between Adaptation and Mitigation]. IPCC, 2007: Inter-relationships between Adaptation and Mitigation at 750. IPCC, 2014: Adaptation Opportunities, Constraints, and Limits in: Climate Change 2014: Impacts, Adaptation, and Vulnerability. Part A: Global and Sectoral Aspects. Contribution of Working Group II to the Firth Assessment Report of the Intergovernmental Panel on Climate Change, edited by C.B. Field et al., (Cambridge University Press, Cambridge, United Kingdom and New York, NY USA, at 908, accessed online: https://www.ipcc.ch/pdf/assessment-report/ar5/wg2/WGIIAR5-Chap16_FINAL.pdf. D.S. Lemmen et al., 2014: Natural Resources in Canada in a Changing Climate: Sector Perspectives on Impacts and Adaptation, edited by F.J. Warren and D.S. Lemmen, Government of Canada, Ottawa, ON, 65-98 at 69 [Lemmen, 2014: Natural Resources]. Lemmen, 2014: Natural Resources at 73. Canadian Council of Forest Ministers, Vulnerability of Canada’s Tree Species to Climate Change and Management Options for Adaptation: An Overview for Policy Makers and Practitioners, by M. Johnston et al., (2009) at 28-32, online: https://www.ccfm.org/pdf/TreeSpecies_web_e.pdf.